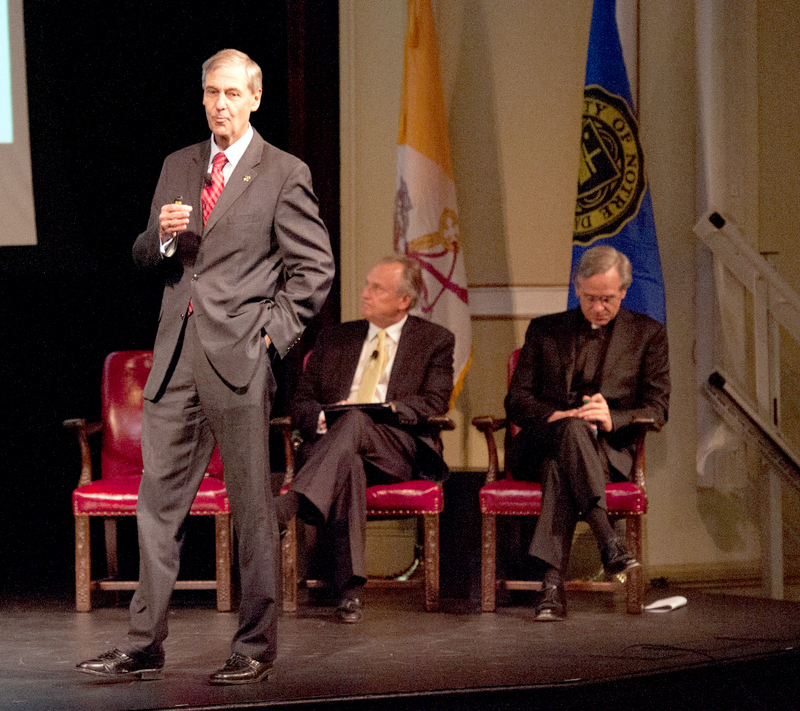 At Monday’s fall 2014 town hall meeting, University President Fr. John Jenkins congratulated staff and faculty on glowing reaccreditation feedback and highlighted the mission of the recently announced Keough School of Global Affairs, while Executive Vice President John Affleck-Graves asked for patience in the face of the inconveniences the Campus Crossroads project will soon bring to campus. After analyzing where students spend the majority of their time, it became apparent that “that area around the stadium is the real heart of our academic enterprise, and around that we have our residential zone,” Affleck-Graves said. Executive Vice President John Affleck-Graves speaks at the fall town hall meeting in Washington Hall on Monday. Affleck-Graves summarized the different facilities that will be housed in the new setup, emphasizing their potential to further increase the University’s academic mission and overall excellence. But until they’re completed, construction will restrict access to that area of campus. “For three years, we’re going to have a very tough, tough construction zone on the south side of campus, and it’s going to impact all of us,” Affleck-Graves said. “We will start work on the east and the west building — the student center and the anthropology building, immediately after the Louisville game this year. Affleck-Graves showed a diagram with temporary fences immediately surrounding the southern half of the stadium. Affleck-Graves showed another diagram, in which a much larger fenced-off area stretched from the Joyce Center to Mendoza. “We’ll have [this situation] for three years,” Affleck-Graves said. “… This will be permanently fenced off. If you want to go north on campus, you can walk through Mendoza [College of Business], or DeBartolo [Hall]. … There won’t be any pathways outside on that side. The same thing on [the Joyce side] … [although] you can see we have constructed a walkway. Jenkins concluded the meeting by commenting on the implications of the plans Affleck-Graves discussed. “I really do think people will look back and think, ‘[this] was a really important moment in Notre Dame history,’” he said. Affleck-Graves said the University will re-stripe the D Bulla Lot, due to numerous complaints about small parking spaces. In response to questions from the audience, he also confirmed that after 2018, current on-campus graduate residences will close, and in the near future an on-campus parking structure seems unlikely due to the cost of construction and maintenance. While “there was really no question that the University would be reaccredited, it couldn’t have been better,” Jenkins said. After briefly mentioning the University’s commitment to maximizing financial efficiency, Jenkins focused on the mission of the recently-announced Keough School of Global Affairs. Jenkins concluded his portion of the town hall meeting by discussing staff diversity and inclusion, and encouraging any staff or faculty to report issues of misconduct.